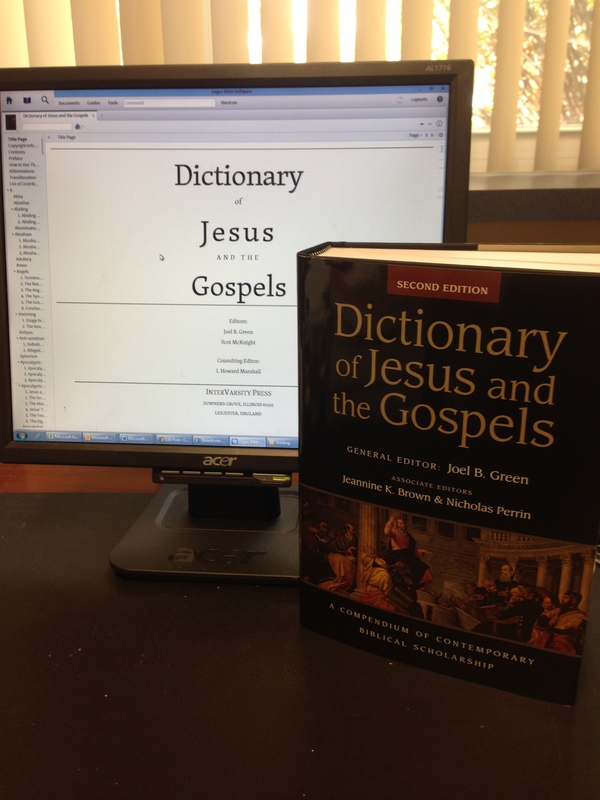 Yesterday was an especially happy day because my copy of the second edition of the Dictionary of Jesus and the Gospels arrived (IVP, 2013). When I was in seminary, the IVP “black dictionaries” were treated as the gold standard of Biblical scholarship. I bought several of the volumes in seminary simply because they were required as textbooks. Even now, I have assigned some of these dictionaries as textbooks. There is hardly another way to get some much information (1) by the best scholars, (2) all in one place, (3) at an affordable price for a reference work of this caliber. I will not get into the nitty-gritty of why there is a second edition, but you should know that it is not a “light” update, it is nearly a brand new product. The publisher and editors put a lot of work into producing a dictionary for a new era of scholarship and ministry. While a number of essay topics are the same, most have been re-written in their entirety with new authors. Sometimes with projects like this, they just add a paragraph and update the bibliography. Not so with DJG2. Let me tell you why you should buy DJG2, even if you own DJG1. There are a number of new topics treated in this edition. Several of them are in the area of method or approach (African and Latino/a criticism, post-colonial, canonical criticism, theological interpretation). Also, there are new entries on the critical study of the Gospels: historiography, and the history of the interpretation of the Gospels; “Criteria of Authenticity” is given its own entry, even though there is a lengthy essay on the Quest of the Historical Jesus; new entry on orality and oral transmission. There are several socio-historical essays that are new: one on cynics, Essenes, Greek and Roman gods, Josephus, Sadducees, and “slave.” Perhaps the most important development is the entry on “Economics” (not found in the older edition). I was also pleased to see a new entry on “Mission” not included in the first edition. While DJG2 is very similar in style to DJG1, the most noticeably difference is the bibliographies. Not only are the DJG2 bibliographies much, much longer, they are designed for ease of reading with author-last-names in bold. Most essays, it seems, are rewritten, often by different authors than the first edition. So nice to have a “Christology” essay by Richard Bauckham and a “Christ” essay by Mike Bird. The “Canon” entry is significantly different because so much has been done in this area as of late. So also for the “Dead Sea Scrolls” essay. The article on “Demons” includes more work on demonology in Jewish literature. The entry on the genre of the Gospels bears the marks of interaction with the latest scholarship (Burridge). Peter Oakes writes a nice essay on “Rome.” Also, “Temple Cleansing” (in DJG1) becomes “Temple Act” – probably a decision to be more accurate and avoid any hint of anti-Semitism. Now, while most entry topics were retained, a few did get removed. Some were just subsumed under another entry (so the focus shifts from “literary criticism” [DJG1] to “narrative criticism [DJG2]). Separate entries for ” ‘L’ Material” and ” ‘M’ Material” are eliminated. So also for “Myth.” Most of these are negligible removals. The only one that disappointed me was the removal of the essay on “Preaching from the Gospels.” There is no entry of this kind in DJG2, and the topic “preaching” is not found in the subject index. This disheartens me a bit because this is an area where many preachers struggle. Since I have not read any of the essays, I cannot really give specifics, but judging by the strong editorship (Joel Green, Nicholas Perrin, Jeanine Brown), the list of contributors, the changes made, and the voluminous bibliographies, I have every expectation that this will not disappoint. I wrote the short essay on “Fasting.” I found the study of the subject fascinating, and this is such a rich discipline in Scripture. I am deeply humbled by being included as a contributor to this important volume. A big thanks to Joel Green and Dan Reid for the gracious invitation. Previous postDid Matthew Try to Replace Mark? – Revisited, the Plot Thickens! I will have to buy this one. Michael – I’m pretty sure that nothing is planned as of yet for other IVP updates like DJG. I think they will “wait and see” how DJG2 does and I bet it will lead to more updates. However, if they are only now in the planning stage, it will take several years for any other new updated volumes. I say go ahead and buy the old ones. My opinion. And with that, my Amazon gift card’s destiny has been sealed. Thanks!